What does every writer-in-the-making need? The right inspiration, the right plot, helpful tools, or the proper environment? Truthfully, all of these! But there’s something he needs when he’s done with all of these, and that something eventually proves to be more critical than everything else. That’s a qualified, patient, and honest editor. While there are heaps of professionals out there who can do the job of an editor extremely well, every small time writer might not be able to afford them. What he needs is someone to do the job for him equally well, but at a much reasonable price. And that’s where the Hemingway App steps in. Hemingway App is a one of a kind online editor that allows you not just to pen down your thoughts, but helps you improve your writing performance by highlighting grammatical, syntactical, as well as prose and voice related errors so that you can make your writing bolder, stronger, and clearer. Check out the amazing features and working of this tool in our complete review here. 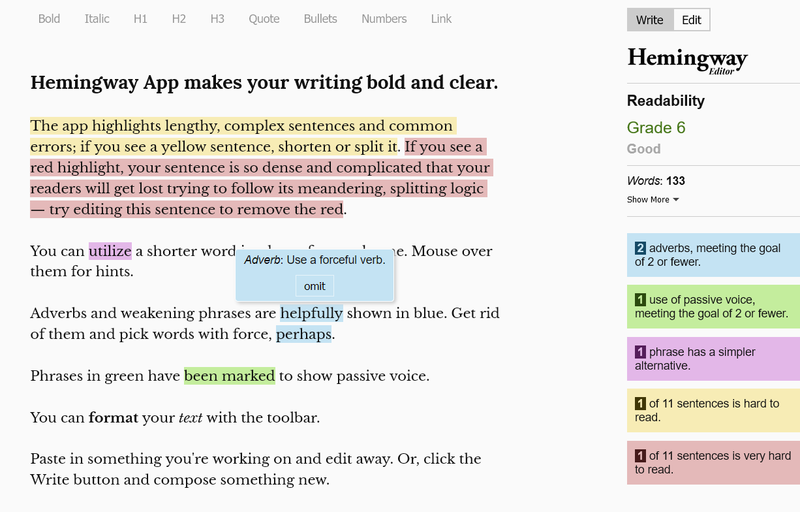 Hemingway App – Making your writing bolder and clearer! Hemingway App is an online writing and editing tool that offers users a distraction-free environment to jot down their creativity. It is a rather simplistic tool with only and only what’s needed for it to do its job. When you visit the tool’s homepage, you land up right in front of the editor with a sample text written within it and suggested changes highlighted in different colors. Each color is associated with a kind of change that the tool suggests you should make. The tool indicates what kind of edit you should make to make your text more descriptive, meet it’s intended goal, hit the audience in the way it is supposed to, and be interesting too! For example, in the sentence “You can utilize a shorter word in place of a purple one”, the word utilize is highlighted to indicate that the user should make an edit here. If the user hovers the mouse over the highlighted word, an appropriate suggestion is made by the tool to make the sentence more readable and easily comprehendible. In this case the suggestion was to replace the word “utilize” with a simpler word like “use”. So basically, the tool helps you tone down your content where needed and also makes it more forceful where applicable. Red for extremely complicated sentences. This sentence should be edited to remove typically difficult words. Blue for adverbs. These words can be omitted to make your writing stronger. By default, the “Edit” mode is selected which will highlight errors on the fly. If you’d like to finish writing first and then make all the edits at one go, switch to the Writing mode by clicking on the “Write” tab on the top-right corner of the screen. This actually helps focus. Text formatting options can be found in a horizontal menu placed at the top of the editor. Highlight the text you wish to format and click the appropriate formatting option to apply. Standard keyboard shortcuts also work. This should help you get an idea of how your readers will perceive your writing. The pros obviously include user-friendliness and utility. However, there are a few negatives too. Many of the tool’s features cannot be experienced with the free online editor. Hemingwayapp is a useful tool. And priced at $19.99, it isn’t too costly either. If a basic editor with correctional abilities is what you’re looking for, this is the app for you. For advanced features however, you might want to look elsewhere. Posted November 13th, 2017 in Content. Tagged: editor, English, errors, readability, writing.